Macrobiotic Asia > Beverage > Sarari Surari tea with Chotto Mate! For you who are meat eater, restaurant goer, and who likes fatty foods. In order to be suitable for serving with meat and fish, we added rich amount of mate from Southern America, which is called drinking salad. Put one tea bag into about one litre of water, and then boil it. Enjoy after taking out the tea bag. 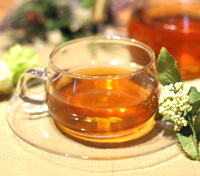 You can enjoy good taste of tea with both hot and cold, but we recommend taking hot tea or normal temperature if you do not make your body cool. Especially, take this tea if you are meat eater or restaurant goer, or in case you worry about your diet balance. Storage condition: Keep at room temperature, away from direct sunlight. For you who are meat eater, restaurant goer, and who like fatty foods. Although I am eating less sweet or carbohydrate food, is it really all right with my diet balance? In my busy life, I tend to be restaurant goer and eat much fatty foods… I would love to refrain from meat and fish, but I cannot stop eating meat! 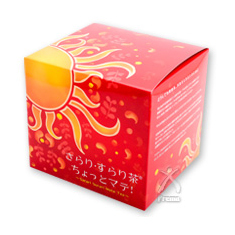 Everyone who likes sweets, who is grain eater, who eats macrobiotic diet or raw diet…"Sarari Surari tea" has been maintaining everyone’s beauty and health and loved by everyone. Based on such the concept, we added rich amount of mate from Southern American, which is called drinking salad so as to suit for meat and fish dishes. The harmony with main components of Salacia and Eastern herbs covers your wide range of diet life. In the morning, lunch, dinner… this can help who eats any foods such as rice, noodle or sweets at night. "Chotto Mate" always supports your active lifestyle. Let’s enjoy our life with good meal! Who is restaurant goer or eats ready-made convenience foods a lot. Who likes everything such as rice, meat, fish, and sugar. Who often goes drinking to socialize or business entertaining. In case you take this with rice, bread or sweets, or you would like to enjoy with all of your family, we recommend you "Sarari Surari tea" as it has milder taste.